Sno-King International Folk Dance Club invites you to celebrate the couples who met at our dances. 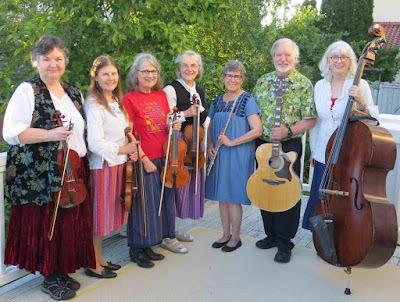 Allspice Band will play, 7:00-10:00pm at the Cedar Valley Grange, 20526 52nd Ave W, Lynnwood. Come with our without your sweetheart. No formal teaching tonight, but we will do lots of easy dances, including couple, no-partner and set dances from many countries. Potluck snacks are encouraged and it’s a good time to wear reds and pinks -- be a valentine! During band breaks there will be request dancing to recorded music. They teach at their regular dances, every Wednesday and Saturday, starting at 7:00pm. Lesson at 7:30pm. Wednesday is all requests, and Saturday has a program of dances, with room for requests. The Grange has a great hardwood dance floor and plenty of free parking. The donation for this party is $8.00 for non-members and $5.00 for members. All regular dances are $7.00 for non-members and $5.00 for members. Yearly membership is only $15.00 ($25.00 for a family).